Japan Material Ltd. will showcase the Matrox Avio F125 fiber-optic KVM extension solution along with the Sharp PN-K321 4K Ultra-HD LCD monitor at Inter BEE 2013 (Tokyo, Nov. 13-15, Hall 8, Booth 8404). Visitors can see a display of 4K footage extended over a fiber-optic cable. 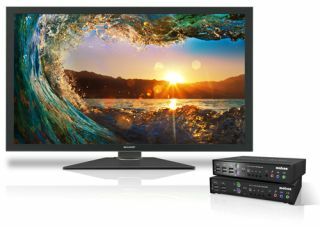 The Matrox Avio F125 KVM extender is designed to extend a workstation’s displays and peripheral devices while maintaining system performance with zero compression and zero latency at the remote user station. With its connectivity options, it enables the extension of two HD videos or one 2K/4K video, plus keyboard, mouse, stereo analog audio and USB 2.0 devices over a single duplex LC-LC fiber-optic cable up to 400 meters in multimode and 4 km in single mode. Extension of 4K video at 30Hz is suitable for preview and playback of Ultra-HD video content. Sharp’s professional-use PN-K321 LCD monitor incorporates Sharp’s IGZO technology offering high resolution and energy efficiency. At 3840 x 2160 pixels (4K Ultra-HD), the PN-K321 features four times the resolution of 1080p full HD making it useful for a range of professional applications in settings where detailed information needs to be displayed with precision such as in post-production, financial services, car dealerships, cosmetics services, video game production and museums.